For a Mass Mobilization to Stop This Attack and Rebuild Labor! In late June, while millions celebrated the U.S. Supreme Court’s ruling on marriage equality, the Court also agreed to hear Friedrichs v. California Teachers’ Association (CTA), a potentially ominous development for public sector unions and unions generally. If the Supreme Court were to uphold Friedrichs, it would effectively mean that the entire public sector in the U.S. would go “right to work.” The case revolves around the question of “agency” or “fair share” fees which non-union members in many unionized workplaces are required to pay instead of dues because they benefit from the union contract. For unions, the consequences of losing the right to collect agency fees are, in the immediate sense, the potential for significantly reduced income, which means a reduced ability to represent members. Many individuals might stop paying dues on the basis that benefits are now “free.” There would also be a blow to workplace solidarity, with union members paying their dues and working alongside others paying nothing and getting a free ride. 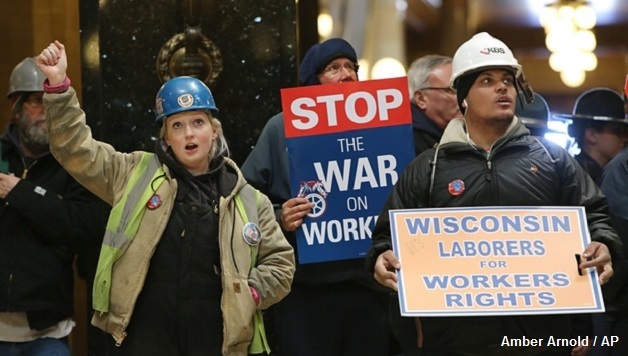 Earlier this year, under its odious Governor Scott Walker, Wisconsin became the 25th state to adopt “right-to-work” legislation for the workforce as a whole. Historically, “right-to-work” states were concentrated in the “anti-union” South. Four years ago, Walker had already forced through – despite mass opposition – legislation severely restricting collective bargaining in the public sector. The results are instructive for the potential effects of Friedrichs. AFSCME has lost two-thirds of its membership in Wisconsin, while the Wisconsin Education Association has lost 30%. Even before Friedrichs, therefore, we had reached a tipping point. Is This the End for Public Sector Unions? There has been a range of responses to the threat of Friedrichs, as well as a lot of commentary, some of it a bit apocalyptic. Of course, we can’t be sure what the response of the Supreme Court will be in this case or how far it will go in its ruling. But remember that this is the “1% court” that allowed unlimited corporate money into the political process in the Citizens United decision. And other recent rulings, such as Harris v. Quinn – which removed the right of unions to have fair share in the home health care sector – are not promising. Some have argued that a defeat in the Friedrichs case could force public sector unions to pay more attention to the needs of their members and be more democratic in order to motivate them to remain members and pay dues. It is also pointed out that fair share did not exist in the public sector until 1975, when the Supreme Court ruled it was legal. The key public sector unions were built, and won recognition and contracts in many workplaces in the 1960s and early ‘70s, without this protection. This is all true, but the gains of the ‘60s and ‘70s were achieved by an ascendant labor movement. There have been profound changes in the past 40 years. 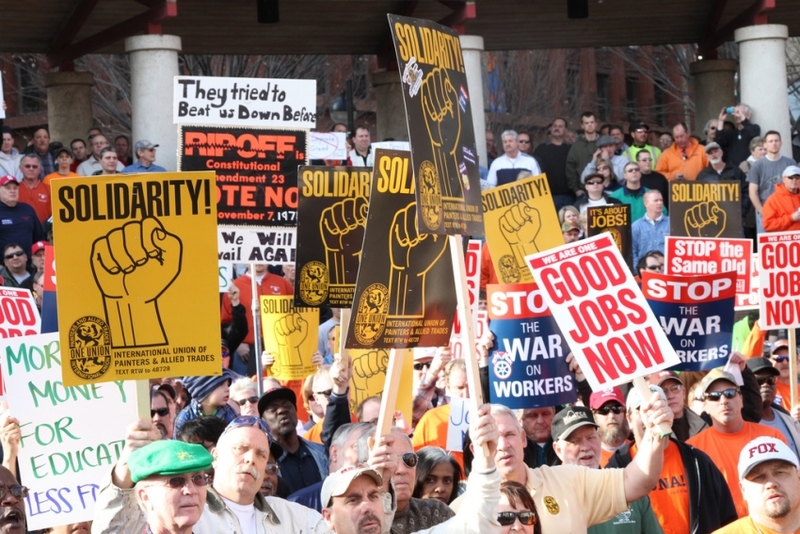 The American labor movement began a long and devastating retreat in the ‘80s. Union density in the private sector is now less than 7%. Recent years have seen record low numbers of strikes. Unions still represent 14.6 million workers, but the problem facing those who would rebuild a fighting labor movement is not simply an out-of-touch, conservative leadership, but the loss of traditions and culture in the base of the unions. The fast-food workers’ strikes over the past two-and-a-half years show that, while there are hundreds of thousands of unorganized workers prepared to fight and sacrifice for better wages and working conditions, there are huge challenges ahead. There is no doubt that a section of corporate America sees the increasing weakness of the public sector unions and wants to deliver a killing blow to organized labor. Another section is leery of the longer-term consequences of devastating the remaining strength of unions, which can act as a safety valve for potentially explosive discontent. Unions with large public sector memberships – like AFSCME, the SEIU, and the NEA – are not of course ignoring the threat of Friedrichs and are focusing on recruiting agency fee payers to the unions. This is an important step, but far more is needed to meet this challenge. First of all, defeat should not be accepted beforehand. A fighting trade union leadership would develop a serious strategy to confront this latest threat to the democratic rights of working people by mobilizing union members, their families, and the wider public to put mass pressure on the Supreme Court. It would link the fight to defend union rights to the fight against devastating budget cuts and the degrading of social services and education for working-class people, and for a national $15 an hour minimum wage. It would place no reliance on Democratic Party leaders who mouth words of support but are, in many cases, the same politicians who have voted through one set of cuts after another. The AFL-CIO and the other key unions outside the federation should issue a joint call for meetings in every unionized workplace in the country, followed by informational pickets and local rallies. However, union activists who see the need to mobilize to stop Friedrichs should not wait for such a call and should begin to show the way now through local mobilizations, days of action coordinated between cities and regions to encourage the labor movement to take bolder steps and overcome the acceptance of defeat by right-wing leaders. Previous articleWe Need to Organize Against the Billionaire Class!